The entirety of England is infested with ghosts of all kinds and only young people can see them. Agencies open in order to fight off the country’s new unwelcome visitors. Children of all ages now work full time jobs on private and government ghost cases and competition between ghost fighting agencies is fierce. 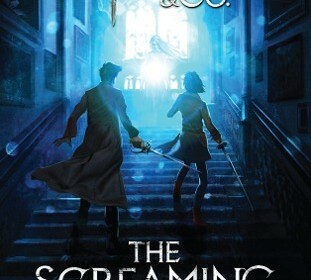 The Screaming Staircase, the first book in the Lockwood & Co. series by Jonathan Stroud, follows the small struggling agency Lockwood and Co.. Told by the fiery Lucy Carlyle, one of three agents at the unsupervised agency, it starts when Lucy and her boss Anthony Lockwood tackle a disastrous ghost. The case does not go well and it ends in the client’s house being burnt to the ground and a £60,000 fine to Lockwood and Co. for the damage. They know the only way to earn the money back is to find a big case, a truly fascinating one, and that’s just what comes their way. One night William Fairfax the wealthy owner of Fairfax Iron comes to them with a case Lucy, Anthony, and their colleague George could never have imagined. Combe Carey Hall, one of the most haunted buildings in the country, has come into Fairfax’s possession and he wants it safe and inhabitable for the living. He offers to pay their fine if they simply show up at the door, but he has some strange conditions for the job. He insists they must come in two days (not nearly enough time to research a case like this) and use no fiery or explosive weapons (crucial for fighting all dangerous ghosts). However, the team accepts the job and they walk into the house that could be their ultimate success or doom. While the story moves fast and is a bit confusing in some parts, I would recommend The Screaming Staircase to thrill lovers and Harry Potter fans. Like Harry Potter, The Screaming Staircase has thrill factor, a supernatural aspect and suspense. Also the dialogue between the main Lockwood characters, Lockwood, George, and Lucy, reminds me of the dialogue between Harry, Ron, and Hermione from Harry Potter. Stroud does a great job building suspense, making it seem like the whole book is building up to whatever terrifying event the characters are about to endure. Stroud also does a great job balancing the characters everyday lives in the agency with their ghost catching. This allows the reader to be even more thrilled when they are about to catch a spirit. This is a book for thrill lovers ready for an edge of their seat adventure.